Cats are fickle, beautiful, and ultimately independent creatures; which means if you're going to center a film around one, you'd better know what you're doing. In the case of Keanu director Peter Atencio, he not only hired the right people to train and guide the seven cats on the set, he made sure that those seven were all that he needed to pull off the various stunts required. His reasoning: because it's way cuter when you use a real cat over a CGI one. 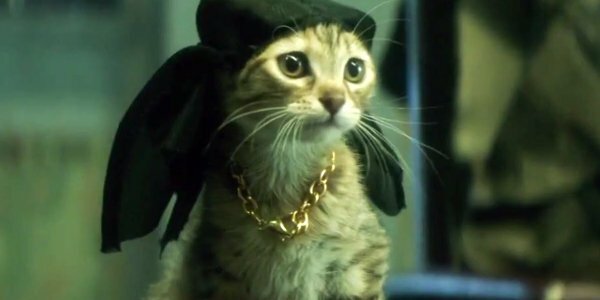 With the decision made to use non-CGI cats to accomplish everything from dodging explosive squibs to wearing a do-rag and fake gold chains, all in the name of the non-stop action, Keanu has been promising its audiences the authentic cat experience since its first trailer. Peter Atencio's strategy was to use trainers Larry Payne and April Macklin, both of Birds and Animals Unlimited, to train the seven cats to fulfill the various functions the Key and Peele starring comedy required in its script. With their arsenal of cat treats, baby food, and behavior modification clickers, Payne and Macklin made the cats in the cast behave just as required. Yet despite being able to train the cats properly, thus avoiding the need for CGI stand-ins, there was still one good reason that could have still seen digital substitutes used in place of actual animals: Keegan Michael-Key is actually allergic to cats. Thankfully, with some medication and proper planning, Key's allergies didn't derail Keanu's usage of real cats, and the finished product looks as if it's taken full advantage of the actual animals approach. Watching the first trailer for the film proved that point, right from the moment when little Keanu meets Jordan Peele's Rell in the opening moments. There's just something about an actual kitten meowing that can't be faked, and the usage of a real cat was easy to spot from the beginning. So knowing there's an actual cat on set, being put through the believable, but pretend paces of danger is all the more harrowing. Peter Atencio's believe of "seeing the cuteness" has already worked its magic in such a short glimpse of the film, which only has us all the more eager to see what the entire finished product is like. Keanu pounces into theaters on April 29th.